Hello and welcome to our session 2 campers! Goodbye to our session 1 campers, you will be missed. It was a beautiful morning here in Bridgton, Maine. The sun was shining and the temperature was a perfect 73 degrees. 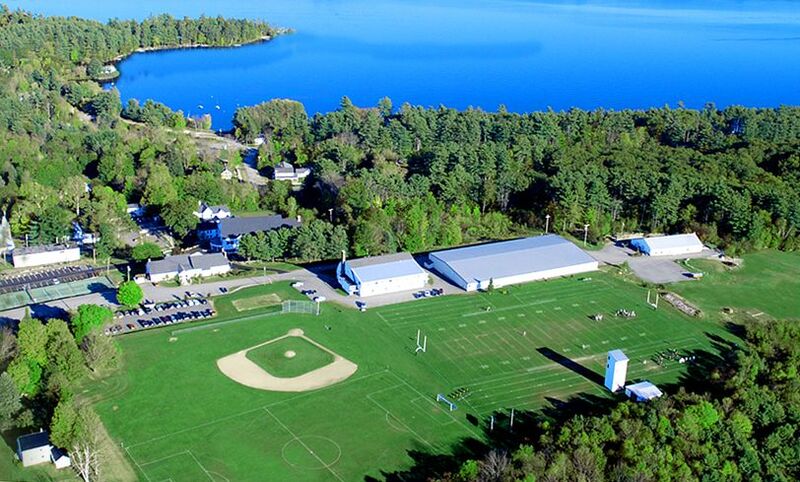 Like every morning, the whistle blew at 7:45am and all throughout camp you heard, “Goooood Morning Bridgton!! Everybody up! It’s a great day to be at camp!” – The classic wakeup call from our fearless leader, Koop. Heading up the hill to the dining hall were tons of new faces. New 8 year olds and new 15 year olds walking together to see what was for breakfast. And what better than chocolate pancakes and bacon for opening day. Don’t worry though…for the healthier ones, there is always a yogurt and fruit bar available. Ice Hockey, Lacrosse, Basketball, Baseball, Soccer. Those are the “majors” here at camp. Every camper majors in one sport and then minors in different sports and activities. Majors are comprised of skills and drills. The kids buy into their sport and really want to improve over the next 3 weeks. The directors of each sport are masters at their craft. All of them come from division 1 college backgrounds and really know how to lead and teach. The first day of majors are always awesome to watch. Campers and counselors come out hungry and are eager to get going. The energy is at an all time high. Everyone wants to give 110% and prove that they are there to get better and to work. Our Lax program had the best major period I have ever seen. The enthusiasm and level of play was incredible. Every single person on the field was running hard and listening to the coaches and director. It was impressive. The other majors were all the same. At our 6pm lineup, each director stood up and gave a recap of the major and there was not one negative thing that was said. All upbeat positive attitudes. Good vibes over here for day 1! Every coach wants their players to be well rounded athletes. Hockey coaches want their players to play sports like lax to improve on their hand-eye coordination. Basketball coaches like their players improving their speed & agility on the soccer field. In addition to their majors, everyone also minors in different sports & activities. When at the minors, it is always game play. On the first morning of every session, we give our campers a weekly schedule with every single period laid out for them. This is important to us, because it allows us to make sure that there are always enough campers at the minor periods to play a full game. At our core, we are Bridgton Sports Camp. However, we pride ourselves in being a perfect mix of a sports camp with traditional camp values. In addition to our sports, we offer an array of activities that allow our campers to try new things and take breaks from the sports. Our waterfront always has some of our most popular minors. Waterskiing, wakeboarding, canoeing, and fishing are always running every single period. Maine has beautiful lakes and amazing weather, and everyone loves getting in there. Many of our campers have never been waterskiing or wakeboarding before and it is awesome when they get up for the first time. This year, we got a brand new pontoon boat that we use during fishing periods. Today, one of our campers caught the biggest fish of the entire summer. It was sick! Don’t worry, after looking at it, they threw it back in the water and we did NOT eat it for dinner! In addition to the waterfront we offer many other activities. Arts & Crafts is a great place to go and cool down and make some pretty neat stuff. Street Hockey & Tennis always get intense. We have a great weight training & fitness / speed & agility program that aligns perfectly with our campers major sports. There are solid workout regiments that campers can work on during these periods that will help them improve on the court field, and ice. After dinner, we have evening activities. Most of the time, it is Bridgton Sports League; aka BSL. We also have free play occasionally. Additionally, we have special events and trips. One night we have casino night. Other nights we do ice cream sundaes. One time we even go to a Portland SeaDogs minor league baseball game. Tonight, we kicked it off with BSL.The way it works is every division is divided up into different teams. Because we are a sports camp, our divisions are college conferences. ACC & Big Ten. Last session our 2 winners were Clemson & Ohio State. Games of Gaga, Newcomb, Volleyball, Handball & Kickball were played on the fields. As it became dark, the games came to an end. Our youngest campers, the rookies, head straight to showers and start hanging out and getting ready for bed. The older guys have a little more freedom. The middle division, the professionals are able to play in the gym and hang on the fields until 9:15. After that, they head to their dorms to shower and prepare for bed. Lights out for them are at 10:30. Because they are the oldest in camp, the seniors are ables to stay out of the dorms a bit later. We don’t have a “shower time” for them. As high school students, they know that they need to shower and wash up before lights out. So concludes our first day of camp. We hope that you follow us on Facebook & Instagram for some sweet photos from around camp. Until next time…Goodnight from Bridgton! !